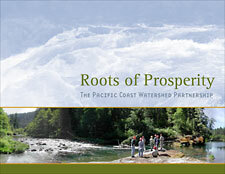 The mission of the Pacific Coast Watershed Partnership is to promote the restoration of naturally functioning watersheds from headwaters to estuary. Perceptions of the natural world vary greatly, both among peoples and across historical eras. Some have viewed nature as a gift of the Creator, others as organic machine or living ecosystem. These days, with the economy playing a dominant role in our lives, we might also turn to the language of economics to understand the natural environment. Cast in economic terms, natural resources function as capital assets. As bank accounts offer interest or stocks pay dividends, healthy natural systems supply tangible and valuable benefits over time. Ecological services such as clean water and climate regulation satisfy our most precious needs. Along the west coast, the yearly return of Pacific salmon is another benefit sustained by the natural asset base. Over the years, active management of the landscape has expanded steadily, often at the expense of natural systems. We have depleted the capital that supports key ecological services — and provides steady streams of income. While hard times have become apparent in some resource-dependent communities, it’s easy to forget that, from the 2x4s in our walls to the cheese on our plates, we all live in resource-dependent communities.